A few weeks ago I created a survey about Mobile Learning. Thanks to everyone that took time out to answer. The results are summarized below. 79% of respondents are interested in learning more about Mobile Learning. 86% think Mobile Learning can enhance the learning experience. 29% have used a mobile device as part of a blended learning experience. The respondents thought that Polls and Listening to Podcasts were the best way to use Mobile Learning right now. 57% of respondents use Facebook Mobile. 29% have used video calling and 50% have used VOIP calling. 80% have published a video on Youtube. 50% have created a podcast. The respondents thought the following five obstacles were equally holding back Mobile Learning adoption. In three years Virtual Training is expected to be the delivery method for over 50% of the training in 65% of the organizations. That's up from 31% of the respondent organizations that deliver 50% of their training virtually today. In addition, over half of the organizations will use Mobile Learning 10-25% of the time in three years versus today where the majority of organizations are using Mobile Learning under 10% of the time. Some feel that the lack of support for Flash by Apple will be a huge detriment to the development of Mobile Learning and others reported that they would like to get involved more in Mobile Learning but their companies are slow to consider Mobile Learning tools as an option. In last week's article, I pitted dynamic images and static images against each other and made the generalization that images work best when there is a blend of both static and dynamic. In one study the point was made that moving animations involving more schematic images were most successful when it comes to learning--and even more successful when static images were added to the mix. Since budget and time constraints may not allow for a large usage of video and audio in your lesson, this week I'm going to focus on static images and how best to utilize them to promote learning. When choosing an image, many designers are under the assumption that more realistic and detailed pictures are the best. However, research shows that this is not the case. Using the Program of Systematic Evaluation, Francis Dwyer of Penn State University found that more complex images caused viewers to over-analyze the image and focus on unintended parts of the image. Sometimes complex images are ignored altogether in lieu of adjacent text. Dwyer also found that between color and black and white images in instructional materials, color was more effective. Connie Malamed, author of Visual Language for Designers: Principles for Creating Graphics that People Understand, has written of her extensive research on low-fidelity (i.e. line drawings) versus high-fidelity (i.e. photographs) images to determine which type greater facilitates learning. Malamed lists several reasons why low-fidelity images are easier for the brain to process, including fewer distractions and quicker visual scanning. She suggests simplifying graphics for learning situations, but leaving enough details for viewers to fully discern the intent of the image. In a study entitled Multimedia Learning: Are We Asking the Right Questions? by Richard E. Mayer, adding images to learning material was shown to improve learning comprehension by 50% when they were paired with relevant captions or audio. Mayer believes the key to good written instruction is to provide "explanative illustrations" which are a "series of two or more frames that show the state of each crucial part of the system at various points." Tom Tullis gave a presentation at Ignite Boston 6 where he discussed whether or not people are drawn to pictures of faces on websites. The study found that people were definitely drawn to the faces, and if the faces were looking at something, the eye was also drawn to whatever the face was looking at it. On the other hand, if the faces were positioned next to information that the participants were meant to draw out of the experiment, participants were less likely to find the information. Those that found the information took longer to do so. Participants were also more likely to feel like they had not found the right information and less likely to trust the accuracy of the information when it was paired with the image of the face. The researchers concluded that people had conditioned themselves to ignore or question anything that appeared even remotely ad-like. In contrast, the same researchers found in a similar experiment that if the faces helped to make the information easier to categorize or understand (for example, pairing age appropriate faces with information about different age groups), that participants focused on the faces and found their presence to be beneficial. Stay away from complex graphics. Pare down more realistic photo-like images to their basic elements. If you have a choice between a basic color image and the same image in black and white, choose the color image. If at all applicable, add relevant captions or audio to images to increase comprehension. Steer clear of using images of faces next to important course content. Use faces only when they directly apply to the content. Click here for Part I of the Graphics Series, Dynamic or Static Images? Click here for Part III of the Graphics Series, Recommended Free Image Sites. Click here for Part IV of the Graphics Series, Easy Image Manipulation. Click here for Part V of the Graphics Series, Tips for Making Your Own PowerPoint Graphics. I had a student from one of my Editing with Word classes write to me in desperation. It seems that he had sent out a document for review. He had carefully followed the procedure for protecting the document for tracked changes, and he had sent it to four people. When the copies came back, every change was marked as coming from "Author." None of the changes were identified as coming from different people. What happened to the function we had reviewed in class where Word shows you the name and initials of each reviewer-and color codes them to boot? My first assumption was that the reviewers' copies of Word were not personalized to have their name and initials to start with. My student checked, but the names of the reviewers and the initials were in fact registered correctly in the Word Options. In Word 2003, that function is found under Tools > Options > User Information. In Word 2007, that is found under Office Button > Word Options > Popular. Some of his reviewers were working in Word 2003. Was it possible that changing the screen colors for tracked changes to something other than "By Author" had somehow erased the identifying information? A second test, making sure that the By Author setting was active throughout the process, again failed to reveal the makers of each change. If they had all been working in Word 2007, I would then have guessed that someone along the way had used the Inspect Document tool to remove all personal information from the document. 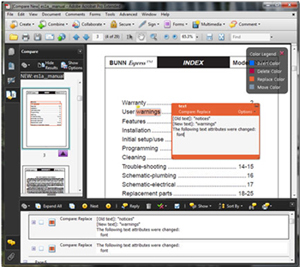 The Inspect Document tool is found by choosing Office Button > Prepare > Inspect Document. But the reviewers in question were using 2003, so there was no way anyone had used that tool. We were, however, on the right track now. Word 2003 has a tool for removing all personal information upon saving a document. That tool is found by choosing Tools > Options > Security where there is a checkbox for "Remove personal information from file properties on save." This setting is also present in Word 2007, but only if you are working on a document that has been saved with that option in Word 2003. In the Word Options for 2007, you can find this tool under Trust Center > Trust Center Settings > Document Specific Settings. On most documents, that tool is grayed out as unavailable. But if you are, again, working on a document that had that setting when it was previously saved in Word 2003, that tool is active, and you can turn it off. I love it when there is an answer. Microsoft Office has so many settings, across all the programs, that it is easy to feel gas-lighted by apparently bizarre and inexplicable behaviors. But I find that if you keep digging, and keep researching, and keep testing, you can find answers. Got any weird track changes behaviors? Tips or tricks for tracking changes? I would love to hear from you. Beginning with Adobe Captivate 4, and continuing in Captivate 5, you can create a link to a PowerPoint presentation during the import process by simply selecting the Link option on the Convert PowerPoint Presentations dialog box. Anybody who has had to update the linked PowerPoint presentation at any point after the import process will appreciate the workflow... simply choose Edit > Edit with Microsoft PowerPoint > Edit Presentation. The PowerPoint presentation will open in a window that can best be described as a union between Captivate and PowerPoint. If you've used PowerPoint before, you will recognize the familiar PowerPoint interface. 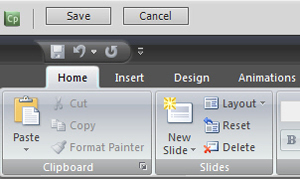 However, there are two buttons you wouldn't normally see if you opened the presentation directly within PowerPoint: the Save and Cancel buttons at the upper left of the window. After making your changes to the PowerPoint slides, all you need to do is click the Save button and the changes will be reflected within Captivate. Nice! Captivate 5 has added a nifty improvement to this workflow... you will be alerted should the PowerPoint presentation be modified by someone else after you have imported it into your Captivate project. Here's how it works: import the PowerPoint presentation and select the Link option as mentioned above and then get on with your Captivate development. At regular intervals, take a glance at your Library (Window menu). The Status column now sports a Synch button. If it's green, there have been no changes to the source presentation; red indicates changes. All you need to do at this point is click the red button and the changes made to the PowerPoint presentation will make their way into the Captivate project. Bam! Looking to learn Captivate? We have a couple of options... we offer two online classes for Captivate 4, Beginner and Advanced. Click here for details on the Beginner class. Click here for details on the Advanced class. We also have a 3-hour class devoted to Advanced Actions. Click here to learn more about that class. Lastly, the new Captivate 5 has recently been released by Adobe. We are currently offering a Captivate 5 Essentials class (the Advanced class is under development). You have two PDF files. Both are named very similarly, and you recognize them as being from the same project. But you don't remember what the differences are between the two. You changed the name a while ago, but you don't remember why. If these two documents were printed, you'd place them on your desk and flip through them to see if you could spot something that makes them different. If you changed the font used for headings or body text, you might spot that quickly, but if a name was changed on page 49 of an 80 page proposal, it would likely take a lot of time to find this visually, if at all. If the only difference is the presence of an apostrophe on page 17, you'd likely never spot it. Luckily, these are PDF documents so you can take advantage of the Document > Compare Documents feature and let Acrobat do the work for you. Acrobat will ask you to select two documents that you wish to compare (called older and newer document). Acrobat wants a hint as to whether its focus will be graphics or text or both so you will then select the type of document your work resembles (such as Reports, spreadsheets, magazine layouts, etc). A new PDF file is created for you, called [Compare New]your_document's_name.pdf. This special PDF document starts off with a summary report, naming the old and new document's file name, some basic facts (such as "No pages were deleted"), and a basic legend of indicator marks. You will also see a Compare Panel open on the left. Pages that have differences are marked with a purple box. On the pages with differences from version to version, comments are inserted to point out these differences. You will find a floating legend with explains the different color comment types--blue for inserts, red for deletions, etc. There is no more guesswork. Not even the smallest difference between the two documents will elude you. Another Acrobat gem! Sign up for one of my Acrobat classes where you will learn that there are tons of neat and useful hidden commands and capabilities. If you're a habitual blog reader, then you've already been made privy to my foray into the effective use of fonts and some font resources. And you've already delved deep into color with my 4 part series on using color in learning (color and mood, color and learning, using color for special needs, and color resources). Now I'm going to turn my attention toward the effective use of images for learning. Dynamic Images are images that can move (such as video). Static images, such as charts or screen captures, do not move. Researchers wanted to know if people learned procedural tasks best by watching a video or working through step-by-step instructions that include images. Results of the research varied. Pick a team--static or dynamic--and you'll be able to find scientific evidence to back up your choice. So which should you use in your eLearning? In a study by Stefan Hartmann for the University of Erfurt, student participants were split into groups and shown how to fold origami by different means of instruction (video, still images, video with audio, and still images with audio). The results of the study showed that for more spatial tasks, instructional information is best presented in video format. If still images must be used, they would be well-served to be paired with informative audio. In a Science Direct study done by Sally Bogacz and J. Gregory Trafton, expert meteorologists were examined to find if they chose to use static or dynamic images for representation purposes and whether the information they extracted from these images was static or dynamic. The assumption was that weather cycles are dynamic by nature so dynamic displays would be the preferred choice. In fact, the experiment showed the opposite outcome. The meteorologists were not only capable of transferring the static images to dynamic images, but given the control of actions this allowed, they preferred to do so. This research shows that not all fields will benefit from animated images. When constructing your eLearning, ensure that you work closely with experts in the field to be able to garner which learning styles work best, including which formats are already used and which formats will continue to be used after the training. Detailed above is just one study on each side of the dynamic vs. static images debate. I found a seemingly endless supply of scientific research pitting dynamic images against their static counterparts. Given the fact that there was evidence suggesting both sides to be effective, I found the studies in general to be inconclusive. The most compelling research I found dealt with combining static and dynamic images to enhance the learning process. Amaël Arguel and Eric Jamet ran a set of experiments entitled "Using Video and Static Pictures to Improve Learning of Procedural Contents," in which the successful use of both static and dynamic images was acknowledged and then expanded upon. They found that by combining both types of images, viewers scored better at performing procedural tasks than they did by viewing either dynamic or static images alone. In a piece by Barbara Tversky and Julie Bauer Morrison entitled "Animation: can it facilitate?" the conclusion was made that while video may often be the best choice for facilitating knowledge, it should be used carefully and in specific ways. For example, schematic, diagram-like animations were found to be more successful than those that were realistic. Adding static illustrations like arrows was found to improve the facilitation of knowledge. Furthermore it appeared as though the real key to making dynamic images work was interactivity. Giving learners the ability to fast forward, start and stop as well as control over the speed, zoom and orientation, allowed for ease of use and let students get straight to the learning that they needed most. It seems to me that combining dynamic with static images is the most sure-fire way to go when designing eLearning. If the budget simply will not allow for such videos, try to use still images in a way that makes them as dynamic as possible by adding audio or interactivity. Click here for Part II of the Graphic Series, Using Static Images to Improve Learning. FrameMaker offers two ways to restart numbered lists in your documents: a manual technique and an automatic option. When you are using these default formats, or others based on the same logic, you simply assign Numbered1 to the first list item, and Numbered to the rest of the list. It's a little clunky, but it works. Is there a better way? You bet. Use only the <n+> building block to set up your lists. Display the Numbering Properties on the Paragraph Designer. Type the building block <n=0> and then click Update All. Don't panic that you now have a 0 in front of every format that you just updated. That's what <n=0> does--it sets the counter to 0 and displays the results. Focus for a moment on the actual lists in your document. Are they all restarting with 1, even without the use of the <n=1> building block? If yes, continue reading. If not, maybe the paragraph you selected doesn't really appear between each list. In that case, Undo your change and find one that does. Once you can see how using another format to reset the list works, it's time to hide the zeros. All you need to do is change <n=0> to < =0> (just change the letter n to a space) and click Update All. Here's why it works: while <n=0> tells FrameMaker to reset the counter to zero, and display the results, < =0> tells FrameMaker to reset the counter to zero and NOT display the results. How cool is that? Adobe Captivate 4: Looking for NeoSpeech? Question: I own Adobe Captivate 4 and need the installer for the Text to Speech software (NeoSpeech). Adobe used to have a link on their site but it's now the NeoSpeech for the new Captivate 5. This software will not work with Captivate 4. Can you help? Answer: I posted the NeoSpeech software on my server. You can download it by clicking here. Adobe Captivate 4: Having Trouble Publishing an AVI? Patience! Question: When I try to publish my CP4 projects as AVI's, the project hangs after several minutes. Any ideas? Answer: Here is a link containing best practices when trying to publish as an AVI. After reviewing the article, keep in mind that the publish process gobbles up a bunch of your system resources. Be patient. 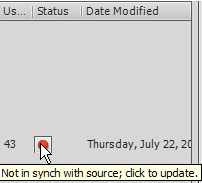 Even on my system, which has memory to spare, the AVI publish process takes several minutes. During the publish process, Captivate appears to crash a few times. However, if I leave Captivate alone, I am happy to report that the publish process completes nearly 100% of the time. Help Authors have long wanted to know: "Am I being helpful?" Adobe RoboHelp Server 8 helps answer that question. Adobe RoboHelp Server is a powerful option used with the RoboHelp authoring tool. In this live class you will receive practical tips on how to configure and publish RoboHelp projects to the RoboHelp Server and to generate user feedback reports. Benefits of content optimization and creating a constant improvement loop with user feedback. What end-users experience as they view content delivered with enhanced power of RoboHelp Server. System Requirements and scenarios for installing Adobe RoboHelp Server 8. Setting up Authoring groups and users - strategies for multiple authoring teams. Creating password protected "Areas" for special audiences. Administering the RoboHelp Server remotely from any web browser. Scenarios for Merging Projects (one TOC/Index/Search/Glossary for many separate projects). Generating User Feedback Reports to determine what topics the end users see and what they search for. Using the reports to continuously modify content. Tips on working with the IT department to deploy RoboHelp Server. John Daigle will be your guide for this three-hour course. John is an Adobe Certified RoboHelp and Captivate instructor (ACP) and has consulted on Adobe RoboHelp Server since its inception. The class is next week. It's not too late to register. Click here to learn more or to sign up.